The new S300 and V300 series are the latest models to join the internal HDD lineup and showcase Toshiba’s new HDD branding concept. 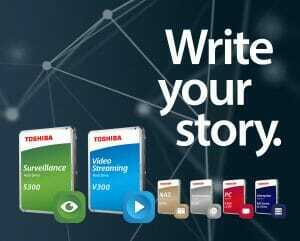 17 April 2018, Düsseldorf, Germany – Toshiba Electronics Europe GmbH (TEE) has unveiled its 2018 lineup of internal hard disk drives (HDDs), which adds two new 3.5-inch HDD families: The S300 Surveillance Hard Drive designed specifically to meet the needs of the surveillance market and the V300 Video Streaming Hard Drive for reliable video recording, editing and streaming. The launch comes at the same time as TEE’s new ‘Write your story’ branding concept for its hard drives, with the internal hard drives now being colour-coded according to application. The new S300 Surveillance Hard Drive (S300) is a highly-scalable, -robust HDD family that is ideally suited to managing the vast amount of data that comes from an array of up to 64 security cameras, which operate 24/7. It is designed for high speed, capacity and reliability to ensure the mission-critical surveillance footage can continually be recorded. The surveillance HDD family is available in 4, 6, 8 and 10 TB variants – an increase of 2 TB over the 2017 lineup. The S300 has a mean time to failure of 1 million hour; features a data buffer up to 256 MB ; implements advanced technologies such as Toshiba’s Stable Platter Technology; and supports large-scale server systems with the ability to back up to as many as 64 high-resolution video streams. Additionally, the S300 supports 8+ drive bays, has a workload of up to 180 TB per year, performs at up to 7,200 rpm with a maximum data transfer speed of 248 MB/s, and comes with a three-year limited warranty. The S300 also includes built-in RV sensors to help suppress vibrations in multi HDD platforms. It supports surveillance network video recorders (sNVR), surveillance digital video recorders (sDVR), hybrid sDVR (analog and IP) and RAID storage arrays for surveillance. The second new family, the V300 Video Streaming Hard Drive (V300) enables users to stream, record, edit and play video on digital video recorders (DVR), network-video recorders (NVR), set-top boxes and TV efficiently and reliably. Furthermore it is optimised for 24/7 operation, making it applicable to use in video surveillance systems as well. It reduces energy consumption by up to 25% (compared to Toshiba’s P300 Desktop PC HDD model) by using a lower-spin design; this also reduces heat generation and gives the HDD a longer life. Additionally, the V300 includes Toshiba’s Silent Seek Technology to minimise noise and heat during operation. Its 64 MB buffer gives smooth performance and its temperature controls curb overheating. The family comes in 500 GB, 1 TB, 2 TB and 3 TB models, has a SATA 6.0 Gbit/s interface and has a two-year limited warranty. The launch of the two new models comes at the same time as TEE’s new ‘Write your story’* branding concept for its internal and external hard drives. This initiative is based on the premise that great ideas need great data storage solutions that are reliable, best in performance and most importantly: safe. Whether you are an infrastructure manager for a datacenter, an architect needing to collaborate by sharing and working simultaneously on multiple files, or a travel blogger / parent needing to safely store precious video and photos everything is possible – with the right tools. As part of this, each internal HDD family will now be colour-coded according to application, helping to ensure the right product is used every time: Gold for NAS (N300), silver for high-performance and gaming PCs (X300), green for surveillance-footage applications (S300), blue for video streaming (V300), red for consumer and professional PCs and laptops (P300, L200), and dark blue for enterprise systems (Enterprise Capacity MG Series, Enterprise Performance AL Series). The user friendly, easy-to-identify color coded drive labels and retail shelf packaging makes it easy for consumers and customers to shop for the drive they need. Toshiba continues to expand product offerings with higher storage capacity and performance. The new S300 and V300 HDDs further illustrate Toshiba’s efforts to continue offering drives for every storage application from PC, gaming, NAS, enterprise and now surveillance and video streaming. The S300 and V300 will be available from April 2018. For further information on the Toshiba Hard Disk Drive products and the detailed product specifications, please visit: www.toshiba-storage.com. 3.5-inch means the form factor of HDDs. It does not indicate drive’s physical size. Number of surveillance cameras support capability depends on model and is defined by performance simulation with High Definition cameras at 10 Mbit/s rate. Actual results may vary based on various factors, including the types of cameras installed, the system’s hardware and software capabilities, and the video compression technology used, as well as system variables such as resolution, frames per second, and other settings. Definition of capacity: A gigabyte (GB) is 1,000,000,000 bytes and a terabyte (TB) is 1,000,000,000,000 bytes. A computer operating system, however, reports storage capacity using powers of 2 for the definition of 1TB = 240 = 1,099,511,627,776 bytes and therefore shows less storage capacity. Available storage capacity (including examples of various media files) will vary based on file size, formatting, settings, software and operating system, such as Microsoft Operating System and/or pre-installed software applications, or media content. Actual formatted capacity may vary. This specification is valid for the S300 10 TB, 8 TB and 6 TB model. Workload is a measure of the data throughout of the year, and it is defined as the amount of data written, read or verified by commands from the host system. This specification is valid for the S300 10 TB model. V300 drives are designed for always-on, low transaction workloads of 72 TB/year.